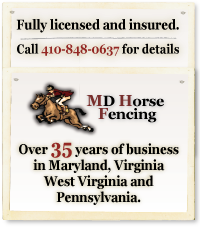 Welcome to the MD Horse Fencing website. Please take some time to browse our site and become familiar with our products and services. We are confident that we can satisfy all your fence and building needs. Feel free to contact us with any questions. Thanks again for visiting.